I really like that you have details such as the lacing. Way too many games have armor just magically floating on the wearer's body. Not really. Shields stayed in use for quite a long while. And this armor has just enough vulnerabilities to make it worth having. Plus, heater shields are commonly used by people in full plate due to their thickness and durability. Men in full plate are vulnerable to mace, bardiche, halberd, etc blows and so the heater is well designed to deflect those. 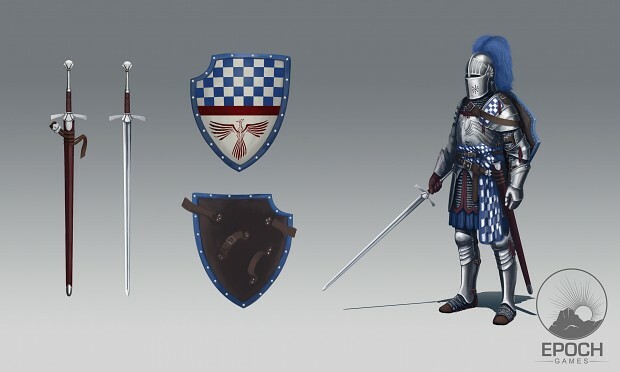 Not entirely useless, but as far as knights and men-at-arms on foot in full plate armor go, shields were mostly discarded in the 15th century in favor of two-handed poleaxes and such. I admit, they weren't useless, but the armor was good enough so that they weren't an absolute necessity anymore. Nope, shields are certainly not useless with plate armor. Overall Althas is surprisingly correct in their weapon/armor design, usage, etc. The only thing that may be slightly inaccurate would be the fire arrows since I'm not sure about their actual historical usage. Fire arrows did actually see usage just not as anti-personel, where they are almost entirely useless. As a seige weapon, certainly, if you launch a thousand flaming arrows into a city then there's a chance of setting something on fire. That then draws man-power away from the walls and such, the last thing you want is to be defending a pile of ash. Fire arrows were used in Mesopotamia, Rome, China and Greece (obviously there's way more),as Epoch_MEB has said, as well as being used against ships and could cause serious damage to enemy armies when combined with pitch (such as in barrels). A Concept Art piece for the Man-at-Arms.